It’s a messy job, but hullers like Bryan Stapleton are paying 15 cents a pound for black walnuts this year. Harvest season for black walnuts began Oct. 1 at the 15 Ohio hulling locations of Hammans Products, with three of them within easy driving distance of Highland County. The Missouri-based company has 215 local buying locations spread across 11 Midwestern states. Bryan Stapleton’s hulling facility is on Cowman Lane, just off Cope Road off of SR 138 between Hillsboro and Greenfield. “It’s by appointment, so call us and we’ll make sure we’re there, and we can hull them out for you and we’ll pay you cash on the spot,” he said. Stapleton has been a Hammons subcontractor for the last seven years, hulling out black walnuts for shipment to their processing plant in Stockton, Mo. Once there, Hammons shells roughly 25 million pounds of nuts each year, producing black walnut nutmeats for food ingredients, and ground nut shells for industrial uses. Stapleton told The Times-Gazette that even the outer husk, which when it’s soft and black can be used for stain and inks, has a use for farmers. 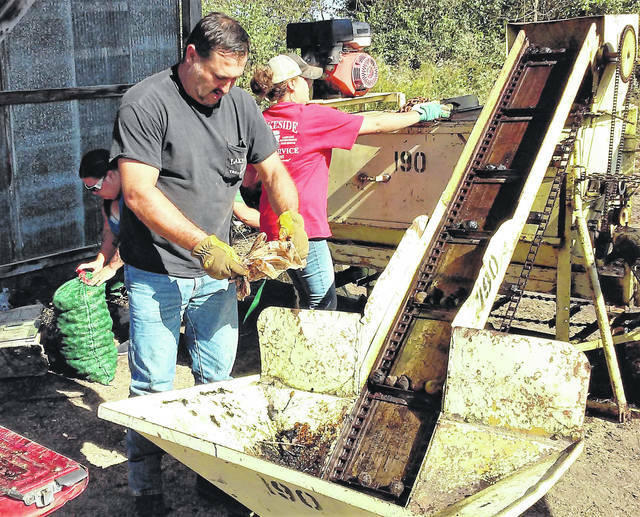 “They take that husk and dry it out, and then it can be scattered over a field and be used for fertilizer since it’s really high in nitrogen,” Stapleton said. He also said there’s a value for the walnut husk that trappers use, since the strong aroma typical of the black walnut tends to mask any human scent that may be on a trap. The process of selling the walnuts to hullers like Stapleton is simple, and starts with a phone call to set up an appointment. Stapleton stressed that the walnuts should be brought in as they’re found.No preparation is necessary since the hulling machine removes the green outer husk. “Even if they don’t have the green husk, or it’s turned black and all that’s left is the nut, bring them in,” he said. Last year was a bumper crop for black walnuts, Stapleton said, with some people making several hundred dollars during the harvest season. His facility alone hulled almost 69,000 pounds of black walnuts. This year, though, Stapleton said the wet spring the area experienced short-circuited black walnut trees’ nut production. Stapleton said that rule of thumb applies to fruit trees as well, which explains why some orchards experienced a reduction in their apple crop this year. Stapleton and the other hullers that contract with Hammons Products are paying 15 cents per pound once the walnuts are hulled. The other two Hammons hullers in this area are Marvin Keims, who serves the Adams County/West Union area on Tater Ridge Road, and Henry Showalter has a hulling operation on SR 138 in Frankfort. With only a few weeks remaining of the harvest season, Stapleton can be reached by appointment at 937-763-4997. The harvest season will end Thursday Nov. 1.